My friend related to me how she was billed P74,000 by a telecom company when she went abroad early this year. That's a huge amount, even if you are rich it is not practical to pay that much especially if you have not really use that service right? This bill shock problem that we all encounter is really a pain in the ^*%. I am glad that I was invited to a press conference yesterday by Telecommunications giant Globe Telecom where they unveiled one of the world’s first-ever all-unlimited roaming service covering calls, texts and mobile Internet, protecting its roaming subscribers from bill shock, or the high surge of charges on a postpaid bill. 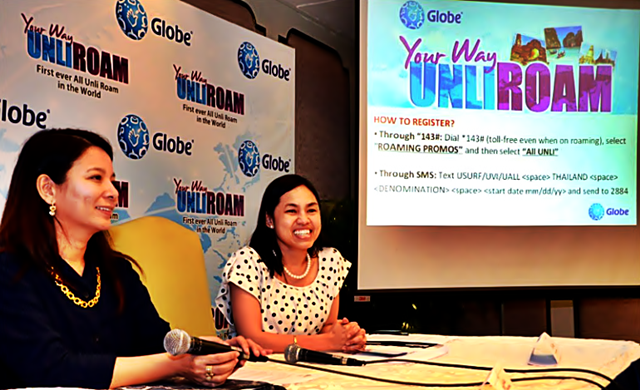 The new product launched by Globe was dubbed All-Unli Roam. This product is a perfect solution to Filipino jet setter/ travel addicts/ Byahera like my friend. From Oct. 11 to Nov. 12, 2012, Globe postpaid subscribers visiting Thailand can register to any of the roaming combos available. $10 for the one-day variant for the Unlimited roaming mobile Internet is available. $27 for the three-day variant. $30 for the one-day variant for the unlimited roaming calls and mobile Internet combo. $90 for the three-day variant. $120 for the three-day variant for the unlimited roaming calls, texts, and mobile Internet combo. This will benefit subscribers as they don’t have to manually latch on to a specific partner-operator because the promo covers all local operators in Thailand. According to Globe's International Business Group Head, Ms. Rizza Maniego-Eala, Globe already has the world widest roaming coverage with partnerships spanning across 200 countries and with more than 600 mobile operators across the globe. She further explain that they also have the widest range of roaming offers and promos, with their unlimited roaming Internet promo available in 19 countries, and their PowerRoam offer which is fully consumable with up to 75 percent discount on roaming rates available in 16 destinations. “We always strive harder to provide our subscribers, no matter where they are, with relevant and value-for-money offers that give them seamless and hassle-free connectivity across the world, allowing them to stay connected with people who matter most to them. Globe All-Unli Roam testifies to this commitment. With this pilot promo, Globe is gearing up to offer more innovative solutions covering more destinations in the future, as we continue to proactively address the needs of our traveler segment,” quips Rizza Maniego-Eala, head for International Business Group at Globe. Thank you so much to Globe and Ms. Rizza for this innovative product. It was nice meeting you Madam.